Chuck all of ingredients into a food processor and blitz this for a couple of minutes. Turn out into a bowl and use your hands to knead them. I prefer a drier stuffing mixture and find the sausage is enough to bind everything together. You can however add an egg if you don’t feel the mixture is holding together well. Take half of your stuffing mixture and spread it over the inside of your deboned chicken before tying up the chicken. Spread some butter over the top of your rolled chicken, with a sprinkle of sea salt and a dash of paprika. Turn the rest of the stuffing mixture into stuffing balls, or stuff them into mushrooms – I made 2 stuffed mushrooms because that’s the only 2 mushrooms I had left in the fridge. 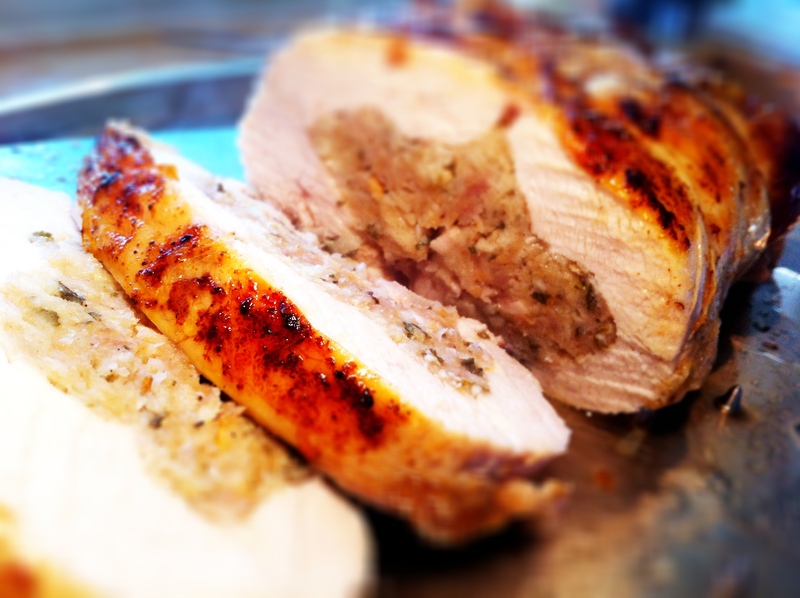 Place your chicken galantine, stuffing balls, potatoes and lemons into a big roasting tray. Cover the whole tray with silver foil and roast for 15 minutes. Remove the silver foil and roast your chicken for another 45 minutes, taking the chicken out to baste every 10-15 minutes. Serve with plainly boiled carrots, blanched spring greens and home-made gravy. Place the wings and bones from your chicken and put it into a stock pot and cover the bones with water. Add 2 bay leaves, 1 onion (quartered with the skin on), 4 dates, peelings from 2 carrots (tops and tails too), 1 tablespoon of soy sauce. Boil the bones for the next hour or so (for however long it takes your chicken to cook) then strain and discard the bones, retaining the stock. Keep reducing the stock, seasoning with salt and pepper to taste. After you’ve removed the chicken from the oven and it’s resting, I also squeeze the juice of the roasted lemons into the gravy, and pour any liquid from the resting chicken back into the gravy. In fact, I pour the stock into the roasting tray to deglaze the tray and get every last drop of flavour into the gravy. Thanks! I’m making that tonight!